The English Football Association is investigating a series of claims, including one of "systemic corruption" related to the proposed sale of Wembley, which have been dismissed as "nonsense and bogus" by Shahid Khan. Fulham's former assistant director of football Craig Kline has made the allegations, 11 months after being sacked by the Cottagers, who are owned by Khan, the American billionaire seeking to buy the national stadium. Kline, a university friend of Khan's son Tony, was dismissed by the London club last year when his relationships with other senior figures broke down. At the time of his exit, he made several allegations about his Fulham colleagues to the police and posted several of them, including claims of bullying and racism, but the police dismissed them and the tweets were deleted. But now Kline has posted three new tweets on his account saying he and Tony Khan have a "paper trail" of evidence about "fraud, child endangerment and exploitation" in the game and claiming that his life has been threatened. Fulham have refused to comment on the claims but Shahid Khan's spokesperson gave short shrift to the latest allegations. The spokesperson said in a statement: "This is nothing more than the same ongoing nonsense and bogus claims made by a former employee who left the club in 2017. Nothing here merits a further response." Kline's first tweet, sent on Monday from the account @CRK1006, said: "Dear FA Council (+relevant police, MPs, regulators, press etc). I have key evidence of systemic corruption relevant to the Wembley vote which I'd like to submit. Please request this info from me." The FA Council meets on Thursday to discuss Shahid Khan's £900million offer to buy Wembley. In a statement, an FA spokesperson said: "We have recently been contacted by Craig Kline who has made a series of allegations about Fulham FC. We are currently in the process of reviewing these allegations." Contrary to Kline's suggestion that the FA is not acting on his complaint, it is understood that he phoned the national governing body's disciplinary team last Wednesday and emailed his evidence to them a day later. He then met the FA on Monday. Kline's time at Fulham was punctuated by frequent rows with the club's coaching staff and other executives as he tried to enforce a data-based, 'Moneyball-style' approach to player recruitment. This led to Fulham passing on several players, including Premier League players Aaron Mooy and Glenn Murray, because they did not meet Kline's criteria, which he refused to share with other staff. Meanwhile, the FA's chief financial officer has told bosses from the grassroots game that the governing body would be richer if it simply handed over Wembley to Khan for nothing. During a three-hour presentation to FA councillors and county FA leaders at St George's Park, Mark Burrows said Khan's offer for the stadium of £600million in cash and £300million in retained hospitality income is the best possible deal they will get. "Wembley is profitable and we do not need to sell - I would be happy to keep running it and would enjoy doing so," said Burrows, who has been leading the FA's side of the negotiations with Khan. "This is a serious and very credible offer and it's a far better deal than we would have got in the market. A forced seller would not get a deal like this. "And the FA will save £72m in capital expenditure over the next six years. It's £18m this year. We are immediately off the hook for this and it's the biggest number in the turnover equation. So we would be better off by handing over the stadium to them, never mind the £600m." 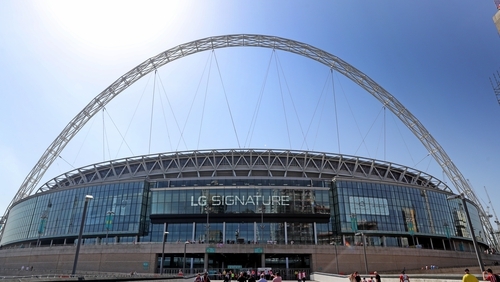 Burrows explained that whoever runs Wembley, which was belatedly reopened in 2007, will need to upgrade its connectivity, hospitality areas and security, which are all "slightly behind the curve". "The question we should ask ourselves is how committed are we to owning a world-class stadium?" he said. The FA's leadership wants to take Khan's money and invest it in community facilities. It believes the windfall would be the catalyst to investing £3.3billion in grassroots projects over the next 20 years. That investment would be managed by the Football Foundation - the charity whose logo is appearing on England's shirts this week - and includes the continuing support of the Premier League and Sport England, as well as match-funding contributions from local authorities and other partners. But most of that money would come from the FA and this week it has told the 51 county FAs this means an average spend of £70million in each of their areas - three times the amount the Football Foundation has been able to invest over the last 18 years. The proposed sale to Khan, though, is not without its critics, and on Thursday it will be debated by the 127-strong FA Council. This explains why the FA has gone into overdrive in terms of selling the benefits of the Khan deal to its members, some of whom still do not appear to fully understand it, while others simply do not trust the FA to get it right. In his presentation, which was streamed online so county FA bosses unable to get to the National Football Centre could watch, Burrows said Wembley would remain the national stadium, would continue to be the home of English football, the FA will still be based there and the deal makes sound business sense. For example, Khan must maintain Wembley's UEFA Category 4 status, so it can continue to host major games, he will not be allowed to move Fulham there, all current English Football League, FA and National League games will still be played at the stadium and the American billionaire would not be able to sell the stadium without the FA and Sport England's consent. Khan wants to buy Wembley so he can relocate his National Football League team the Jacksonville Jaguars to London but Burrows said football would have priority at all times apart from gridiron's autumn regular season, which means the Three Lions would go on the road for up to three games a year. Burrows added that if Khan broke any of the terms of his agreement with the FA and the public bodies that invested in Wembley's rebuilding, it could result in the FA being able to buy the stadium back for as little as £1, if Khan goes bust, although it is more likely to be at a fixed price of £100million.